new year's eve . . .
i feel like i should do some reflective post tonight ... looking back over the past year and everything that has happened. but i'm not really like that. lol! i will take a few moments to sum it all up ... for journaling sakes. family. been a good year for the family. girls are growing up so fast. sarah turned 8 ... finished 2nd grade and is halfway through 3rd grade. alyssa turned 11 ... finished up 5th grade and is halfway through 6th grade. both girls had an excellent soccer year. their 5th year playing soccer ... fun to see them grow as players. alyssa did year-round soccer this year ... while sarah took another try at softball. both have done great at awana's at the church ... participating in a few choir programs also. joe's doing good. still working hard at safeway ... doing the night shift. stepped down from night crew manager a while back ... but has taken over more responsibilities with ordering and displays. umpired another year for high school baseball ... getting ready to start up again soon. golfing whenever he can ... with tournaments every month. work. work is good. 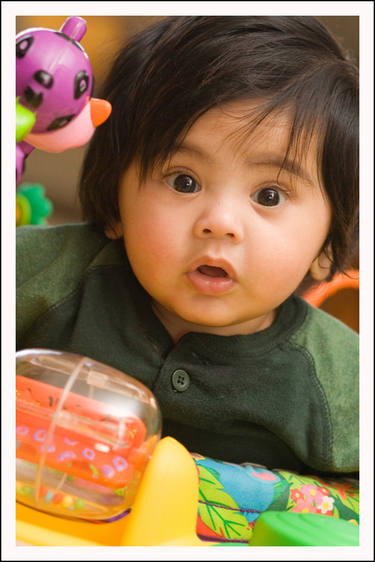 we've seen 5 new kids this year come to our daycare. we've been able to see 3 seperate babies growing up right before us ... sharing in their little lives. we did have a few kids leave us ... and we miss them. had some changes this year that we're still trying to figure out ... but will probably never understand. but overall ... a good year. crazy year though ... in a "tons of kids running all over the place and driving me crazy" kind of way. lol! but it's all good ... love them all! health. this one is a tough one. still hard dealing with having a "chronic pain disease" that i know will never go away ... and will probably get worse. and yet ... i am so thankful that for the moment i'm getting by. i go through my days and do all the things that i've always done. i may be in pain ... but i can do them. i think in a lot of ways ... i've mentally accepted that the pain is a normal part of my life now. so i deal with it. and while it's not great ... i'm glad it's not worse for the time being. friends. i am so thankful for all my friends. the ones in my everyday world ... and all the friends i've made online. unfortunately i have had a few friendships change recently ... maybe for good. but through the bad times ... i have found that my true friends have been there for me and supported me. i appreciate them more than they know. photography. wow, has my photography seen quite a year. not to sound full of myself at all ... lol! but such a difference between the photos i took at the first part of the year ... and what i take now. i still have tons to learn ... and sadly, i am not that good about getting in there and getting serious about learning. but i have learned some valuable tips and skills ... and i do believe it shows. 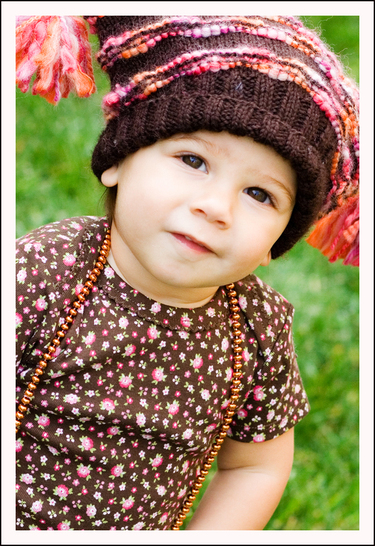 i'm grateful for all the mini "photo-shoots" i have had this year. love to be able to practice on my friends and family. so glad they let me shove my camera in their face time and time again. scrapbooking. been such a great year. i feel like i came into my style so much this past year. i owe a ton to my mentor ... she took the time to give me some advice and help ... and inspired me to start printing my own photos. may not seem like a big deal ... but it has changed the way i scrapbook. i have had some amazing opportunites this past year ... and i am so thankful for every single one of them. and i love that the opportunities have been so diverse ... love being able to work on so many different kinds of projects and seeing how they all work. while it's hard to keep quiet sometimes about stuff that is going on ... i am so thrilled that i have "stuff" to keep quiet about! lol! blogging. i blogged a lot this year. just last week i decided to start my "blog book" ... and i uploaded all my posts from 2007. i knew it was a lot ... but it turned into 440 pages worth! love to go back and read all my old posts ... to see what was going on back then. i have made so many great friends through my blog ... i appreciate every single comment that is left here ... and i love finding new blogs to read through those comments. and while i've been told that i blog about things i shouldn't be blogging about sometimes ... i wouldn't change any of it. this is my journal ... and i like to keep it open and honest ... i don't want to pretend the bad moments don't happen. besides ... the good stuff far outweighs the bad stuff. cooking. how can i leave this one out? lol! it was a year ago that i got my rachael ray "30-minute meals" cookbook. it has changed the way i cook. seriously. i hated to cook before. and while i'm still not always thrilled to do it ... i have realized that it really doesn't take that long to cook up something good. 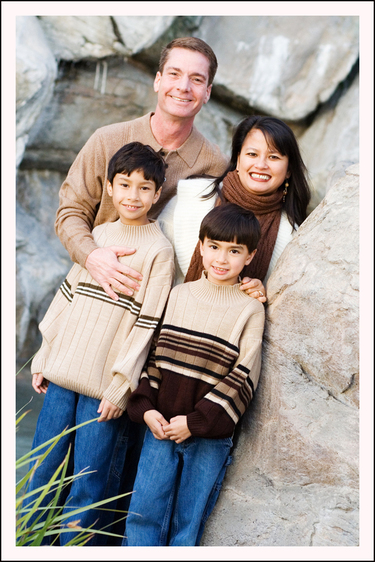 it doesn't have to be hard or time-consuming. i think that sums up things pretty good, don't you think? i'm sure i'm forgetting something ... but i can't think of it right now. no big plans tonight. joe is working as usual ... he'll be at the store to ring in the new year. just the girls and me here. i'm not sure if they want to stay up until midnight. they're realizing that they have to get back on schedule for school ... they go back on wednesday after being off for almost 6 weeks. we've been sleeping in a lot more lately ... so we need to get back to our routine. alyssa keeps telling me that "i don't want to stay up until midnight" ... and i had to explain that she doesn't have to ... it's not a rule or anything. lol! so ... here's to 2007. and like sarah said today "goodbye 2007 ... bring it on 2008!!!". i'm still here . . .
figured i'd better update this blog ... before all my loyal readers stop coming by to check on me. lol! i feel like i lost track of everything these past few days. no real reason really ... not super busy or anything. don't know what i've been doing really. christmas was good. the girls got some fun stuff ... but not too much, luckily. lots of clothes, new little camcorders, they're very own laptop to share, tons of games, new shoes, etc. no dolls whatsoever ... nice to not have to unpackage bratz dolls and polly pockets for once. lol! everything is put away ... and has a home. joe got some cologne, a new wallet, and some clothes. i got some cooking stuff, slippers, the last season of "gilmore girls", and a fun little scrapbook kit. took down all the christmas decorations today. still have the lights on the house to take down ... joe will get those on his day off. i usually wait until new years to take down the tree. but yesterday while i was watching the daycare kids ... i started on it. figured i might as well get started ... that way i wouldn't have to use all my time off for it. i do miss the lights in the house though. 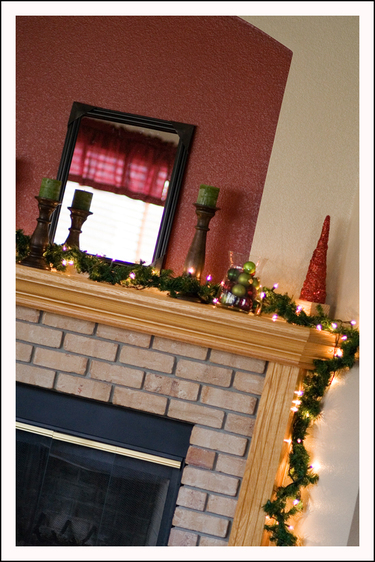 now the fireplace mantle and the table by the front door just look boring. lol! the girls both got gift cards to build-a-bear ... so i took them and amanda there on thursday. alyssa decided that she had enough bears ... so she just picked out some outfits for them. the cutest soccer outfit, a karate outfit, and the most adorable little sweatsuit ... along with a "high school musical" shirt and a "hannah montana" shirt. sarah got a new bear ... and a couple of outfits. a fancy dress, and a sassy pink and black sparkly outfit. amanda got a new bear too ... and a fun "it's about ME" outfit. and it all took us only 2 hours to pick out! lol! i havn't touched my christmas journal since those last 7 pages i did. i know that honestly i won't finish them all ... so i decided to go through and pick out about 8 more that i really want to include ... and then get those done. i have 16 pages done ... so that will be a good sized album. and being that christmas is over ... i'm not sure how much longer i can keep scrapping it. i did find some more of the pattern papers and stuff this weekend ... hated the idea of running out right at the end. also finished a baby album for my cousin's wife to give to her friend. did that make sense? lol! she had photos collected for the baby's first year ... and wanted them in an album. i have to admit ... i have a hard time scrapping other people's stuff sometimes. so i kept it really simple. in fact ... joe saw it and asked if i was really done with it. lol! i started to second-guess myself there for a minute ... and then realized that most people (meaning "non-scrappers") would consider my take on "simple" amazing. lol! had a fairly easy work week. this was the first year i took christmas eve off work. so i really only had 3 days this week. we were missing nikolas and ariana this week ... since they were both home all week ... they're moms had the week off. and matthew was gone all week. we just had haley and amanda ... nice and quiet. i got my books from shutterfly this weekend ... the digital books i had won last month. love them!!! there was actually a mix-up with the kind of book i had actually won ... i never did find which book it was supposed to be in fact. but since i had my books already designed ... they were super nice about switching out my codes and getting my order in. i will have to show you some pics of it. i'm not a digital person ... but i just love the way this book turned out! i have some assignments and projects i need to work on. 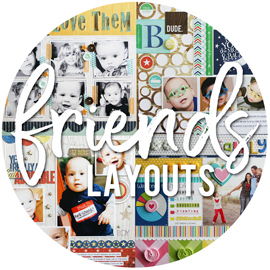 i can't even remember the last time i scrapped an actual layout ... one with photos. lol! i have some in mind though ... and some i need to think about. so i hope to find some time for that this weekend. this afternoon i went out to meet alyssa and her dad to pick her up. while i was gone i guess i had a visitor. trace ... one of my daycare kids that left a year ago ... came by to see me. joe said it was the funniest thing ... as soon as he opened the door he just walked right in and strutted over to the family room like he owned the joint. i can totally picture him ... the funny way he used to walk around. lol! and i love that ... that a kid can be gone for over a year ... and walks in like he never even left. that means the world to me ... to know that they still remember me and remember being here. so sorry i missed him! speaking of missing little ones ... miss adyson had a birthday yesterday. little girlie is 2 yrs old! even though i havn't been able to see her in over 2 months ... i hope she knows that i'm wishing her a very special birthday. and that we all miss her like crazy! guess that's it for now. just wanted to do a quick update. hope all is good with everyone! more journal pages . 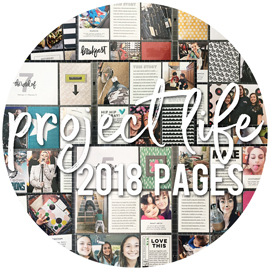 . .
too tired from my "unpacking, sorting, and putting away" activities today to talk much ... so i'll just share some more of my journal pages with you. i did update the last 4 pages with better photos. i ended up doing my title page and 7 more pages all from start to finish on monday ... not too bad, right? this is my title page for the journal. this is one big chipboard word! keep in mind these are all 8x8 pages ... so this awesome "joy" word from making memories was a perfect fit ... plus, i adhered it using pop-dots so it's extra bulky! and i love the little sticker on the bottom that says "created by the head elf"! lol! making memories flocked paper, rubons, chipboard word, ribbon, metal tree ... 7 gypsies sticker ... circle sticker from the CK card kit. day #9 ... to journal about some of your family traditions. i really couldn't think of many ... is that bad? need to make more traditions next year! making memories pattern paper, ribbon, stickers, line art stickers, chipboard accent, glitter brad ... 7 gypsies sticker ... heidi swapp chipboard letters. day #13 ... to journal about gifts ... how they get from under the tree to the person they're meant for. and tell me we're not the only family that uses a laundry basket in the center of all the craziness to catch all the wrapping paper? lol! making memories pattern paper, stickers, line art stickers, chipboard accents, ribbon, chipboard letters ... and one little 7 gypsies sticker at the bottom. i have one more ... but apparently i forgot to get a picture of it. i don't think it really matters ... but i'm trying to keep this all in order. but since i'm not working in order i keep getting confused. lol! i pull pages out and then add them back in ... double checking over and over to see if i got them in the right order. maybe numbering them would have helped. lol! the other one i had done was the "menu" page ... what we all ate on the big day. so i'll add that in the next time! as of today ... i'm 10 days behind. and i believe we still have 10 to go if i'm counting right. it's actually through the first week in january. my album is already super thick ... so hoping i can fit in 20 more pages. and i'm beginning to worry that i may not have enough pattern paper to finish ... really trying to use all my scraps. i may have to track down a few more sheets to finish! i know it's just about over ... but wanted to wish everyone a "merry christmas" from my family to yours! the girls are back, celebrations are done, presents are opened. i have about a zillion gifts spread out all over the house ... it looks like christmas went and sneezed all over the place! and i have daycare kiddos coming bright and early tomorrow. so i'm thinking i should go and clean it all and get it out of their sight. so more to come later. 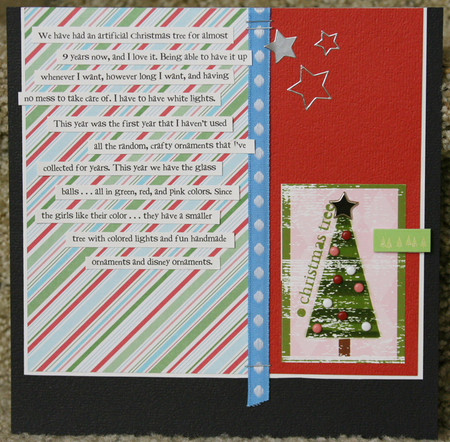 and i also have 4 more christmas journal pages to share! hope everyone had an excellent holiday! 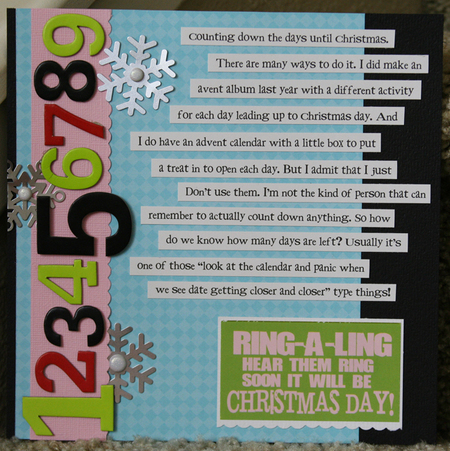 christmas journal 15,17,22,23 . . .
wow ... 2 posts in one day. shows you what i can get done when spending a holiday by myself. lol! so today is the 24th ... and i've done 9 pages ... which means i was now 15 days behind in my christmas journal. lol! you should see my desk right now ... covered with pages in the works. i have 4 that are totally done and wanted to share them ... but bare with me because by the time i got them journaled i had lost my good lighting for taking pics! i will re-take them hopefully wednesday and then replace them here ... these are so blurry and bad. edited to add: new pictures added ... not quite so blurry as before. lol! day #15 ... to journal about who you visit or who visits you on the holiday. most of our years are the same ... same people, same relatives, same places. so this basically sums up our schedule. super simple ... in fact, i feel like i need to add something. 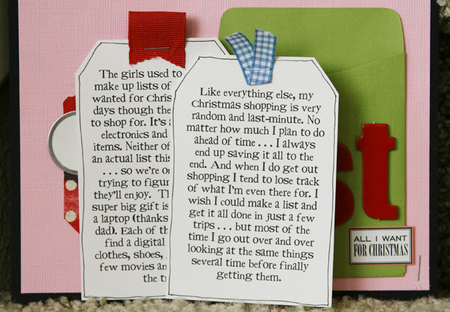 making memories pattern paper and chipboard stickers ... heidi swapp plastic letters. day #17 ... to journal about a gift that you had got for someone ... one of those "i saw this and totally thought of you" type gifts. doesn't happen often for me to be honest. lol! i decided to do one of the gifts i got for sarah. first time i saw these "webkinz" i thought they'd be perfect for her. although to be totally honest ... i just went and got her 2 of these this morning. lol! making memories pattern paper, tags, metal snowflakes, brads ... heidi swapp chipboard letters ... and autumn leaves rubons. day #22 ... to journal our "to-do" list. i know, i know ... my list doesn't look that long, right? lol! i just couldn't think of anything ... although i'm sure there is more that i'm just too scattered to keep track of. making memories pattern paper, ribbon, line art stickers ... heidi swapp chipboard letters ... and buttons from my stash. day #23 ... to journal about our stockings. our stockings are old ... and i don't love them at all. is that bad? i want new stockings every year ... just never look for any. i did see some on clearance last night at michaels ... but didn't get them. maybe i should have ... they were simple and the perfect color. oh well. we never hang up our stockings until christmas eve ... so they're really only up there for one night. 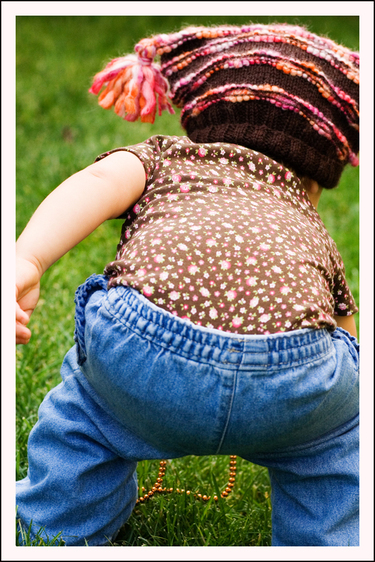 just too hard with the little kiddos running around ... they would totally yank them down anyways. making memories pattern paper, trim, snowflake stickers, ribbon ... heidi swapp plastic letters ... 7 gypsies stickers ... and daisy d's tag. hopeing to get a few more pages done tonight. would be fun to bring this album tomorrow and show the family. i never did do the album cover. i used a 8x8 album i had laying around ... it's super thick and can hold a ton of pages. i was thinking that i'll add in all the cards we got this year ... and maybe even do a few layouts with the pictures we take tomorrow. would be fun to have the entire christmas in one super thick album! so, it's christmas eve. i remember posting last christmas eve ... and it's pretty much the same this year. feels like just another day. kind of drab ... kind of sad. except last year alyssa was at her dad's celebrating ... and this year both the girls are there. joe's sleeping just like last year ... because he worked last night, just like last year. i'm doing laundry and some cleaning up ... just like last year. still have some "lifetime" christmas movies recorded ... just like last year. lol! just not the same here without the girls. but i know they're having a great day. sarah went with alyssa ... i know she has lots of presents under their tree, so she's going to be loving it! i will miss them tonight though. noone here to hang up the stockings ... put out milk and cookies for santa ... and just enjoy the excitement that is "christmas eve". and then christmas morning ... no one to wake me up wanting to rush to open gifts and see what came in their stockings. i'm sure they'll be back around 10am or so ... but not the same. thanks for all your good-luck wishes for my dinner on saturday. it all went good. i was crazy in the kitchen for hours on end. don't get me wrong ... people did offer to help. but i didn't want anyone helping with anything ... mainly because i just had sooooooo much going on at once. i was in my "cooking zone" and didn't want anyone breaking my concentration or i'd lose track of what i was doing. lol! everything turned out ... and tasted pretty good. the turkey breasts worked great ... although i cooked up 5 of them (forgot joe's brother was bringing ham) and we only needed 3 ... so lots of leftovers. i did something good today. and i'm not sharing this because i want a pat on the back ... or because i want you to think i'm this giving person, or because i want recognition. i'm just feeling good because for once i thought about doing something for someone ... and i actually did it. i'm the kind of person that thinks of doing things for people all the time ... but then i forget or get busy or sidetracked ... and never do anything in the end. like when i go through the drive-thru at starbucks and think "wouldn't it be nice to pay for the person behind me" ... but then i chicken out, or worry that it will be the car that had like 5 drinks ordered. lol! and i'm very self-concious ... so i always think about doing things ... and then worry about what people will think or say about me (even though i'm thinking of doing good things ... just never know). so this morning i ran out for a few very last minute things ... and i passed a few homeless people up by the grocery store. i always feel bad just driving by ... feeling like i should offer them some help ... but not sure what they could really use. as i drove by today ... i thought about all the extra food i have in my fridge. tons of leftovers from our dinner ... a lot of which we probably won't eat. as i was driving from place to place ... i kept thinking i should put some together and pass them out. when i got home ... i didn't even take time to think about it. i didn't say a word (as some of you know, i talk to myself all the time about everything!). i just took everything out of my fridge and started heating things up. i made up 2 big containers with the works ... turkey, potatoes, stuffing, green beans. added some little things of cranberry sauce and dips ... with baggies of crackers, olives, nuts, and cookies. added a bottle of sparkling cider and forks and napkins. without giving myself time to think ... i packed up 2 big bags and got in the car. pulled right up in the parking lot at the grocery store and found 2 people that looked like they needed a good meal. they looked so appreciative and thankful. and it felt so good. i feel proud of myself ... for finally following through and doing something for someone that needed it. even though today feels lonely and drab ... i have so much to be grateful for. even though i don't have my whole family with me today ... i have a family. i have people to spend tomorrow with. i'm glad i had the chance today to take a few moments and remind myself all that i have to appreciate. hope you all have a very merry christmas! 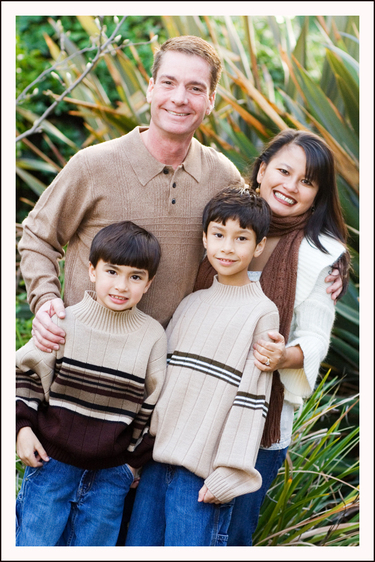 enjoy your families and your time with them! busy, busy . . .
i think i'm ready. but i'm probably not. lol! 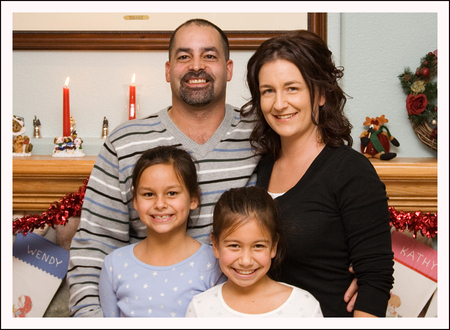 joe's family and some of his friends from "back in the day" are coming tomorrow for a christmas dinner. we have 20 people total. and i'm cooking! i do have a few things being brought ... a veggie tray, rolls, green bean salad, spanish rice (joe's family always has this) and a couple of pies. but the rest is all me. so i'm cooking up boneless turkey breasts. joe got the meat guy to de-bone them all for me ... i have 6 good sized ones in the fridge. pretty inexpensive really ... so i figured we'd better be safe than sorry and get extra. i'm also doing mashes potatoes ... and a gratin potatoe mix with all sorts of different varieties of potatoes. some stuffing ... i don't like stuffing ... but others do i guess. lol! got some canned cranberry sauce that i'm going to spruce up with some good stuff. a spread-dip thing with little breadsticks and toasts. i just made some sugar cookies and have a 4-layer dessert that is in the works. so you'd think i would be ready. but i havn't thought about the time frame that all of this is going to happen in. lol! have to figure out how i'm going to do it ... when i'm going to do it ... and how to keep it all warm ... and not have dirty dishes everywhere. the only thing out of a can is the cranberry sauce and the olives ... everything else is completly fresh. so that seems to involve some chopping and mixing. and i still have something for joe's mom to finish. can't tell ... because all the grandma's get one (we have 3) ... and one of those grandma's reads this blog. lol! i know, i know ... it's after 9:00pm ... and i still have to finish them! but on the bright side ... the entire house is clean and picked up. all the "big" baby stuff is out in the garage ... the bouncer, the exercauser, the jumper, the booster seat ... and all the larger toys like the dollhouse and shopping cart. the kids table and chairs from the playroom are in the garage. we have the large tables set up and chairs borrowed from my parents. bathrooms are clean. floors are clean. laundry is done and put away. everything is dusted. 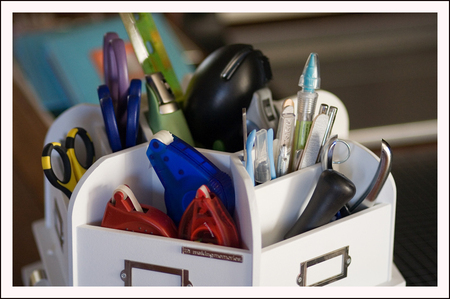 all evidence of "clutter" is hidden away in drawers. this post read like a "mental checklist", didn't it?!?! lol! guess it's my way of running through everything ... trying to figure out what i forgot! well ... wish me luck! and hope you all have a great holiday weekend. a little christmas decor . 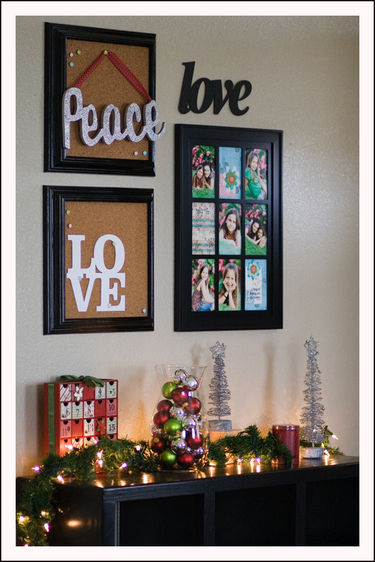 . .
so a few of you asked for some christmas decor photos. i don't have much, really. i tried to take some pics both yesterday and today ... and i wasn't very good at it. lol! but here's a few for you. our tree. i did good on the garland this year. every year for the last 3 years i have put on this wooden button garland ... and every year i would have to go buy just one more strand because i would run short. but this year i got it on my first try. 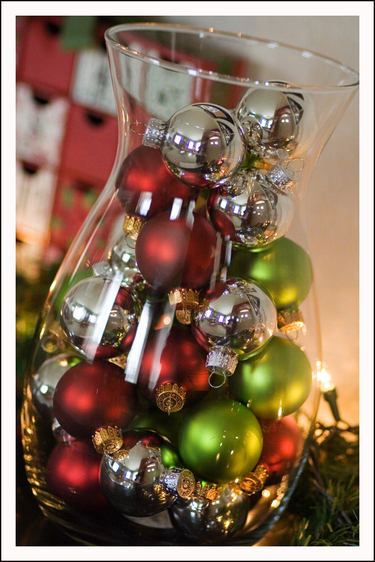 simple ball ornaments. and a few clear ones that i stuck some buttons and beads in. and a few i put coffee beans in ... love the smell! the fireplace ... i know, self-explanitory! i still need to hang up the mirror ... way too small for that spot ... but it was only $10 so i couldn't resist. the red christmas trees are super glittery ... got them at walmart. my super cheap glass vases (like $3) filled with some more ball ornaments. notice there are no stockings hung up? that's because they little ones would yank them right down ... so we never put them up until christmas eve. i do love this picture. this is by the front door. i was going to split these ornaments into 2 vases ... but they only had 1 left. and the advent calendar in the background is from making memories ... found it at target. everything was there ... just had to put it together. although there is nothing in the boxes. lol! this is by the front door. love the black shelf that my mom made me ... the bottom 2 shelves hold baskets that the girls keep their shoes in. the top shelves are empty ... usually there's junk shoved in there (cleared it out for the pic). the frames i had spray painted black and added some cork inside. i never hang anything up there though. lol! i did find the chipboard "love" and stuck it there ... trying to figure out what color to paint it still. ignore the fact that i have 2 "love" things up there. lol! the glitter "peace" i found at kohl's for like 70% off. and this is a terrible picture ... but still funny. 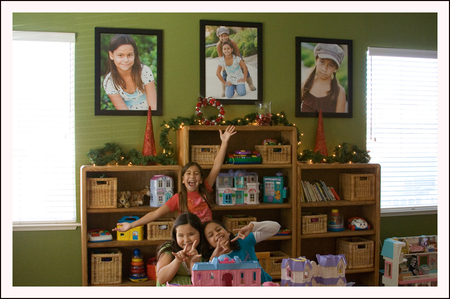 i was trying to get a picture of the super huge frames i put in the playroom ... and the girls thought it would be cute to get in on the fun. these frames are 18x24 ... love how big they are. i think one i get around to putting up some valences on the windows it will look even better. this is the playroom ... which is where you would normally find a living room/dining room. the wall to the right of this is where i have all the daycare kids pictures. i have 16 frames up ... all 8x10 ... all of kids that are here with us or have been in the past. that's about it. sums it up pretty good. lol! going to cut this short ... because i have about 17 zillion things to get done right now. have a good one! few more christmas journal pages . 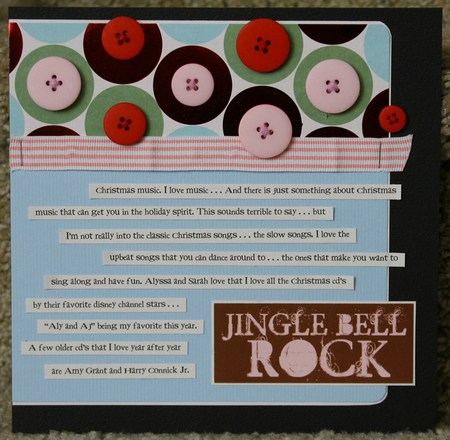 . .
finally got to creating a few more pages for my "journal my christmas" class. did these 3 yesterday. this was day #11 ... to journal about your christmas tree. this year i actually used new ornaments. i had bought about 6 boxes of the glass balls ... something we never have had. i got jewel-toned reds, greens, and pink. i put them on the tree ... and then had every intention of adding in some of my more crafty-styled ornaments from the past years. but they never made it on ... i like the tree simple like it is. this is making memories pattern paper, ribbon, line-art stickers, chipboard accent ... rusty pickle tree sticker ... and brads left from the christmas card kit. day #14 ... to journal about christmas music. i'm all about the more up-beat christmas songs. i have a small collection of christmas cd's from over the years ... but the ones i pull out the most are amy grant and harry connick jr. but this year i've been more into the disney stars music ... i'm a sucker for their stuff (as i'm sure you're all aware by now. lol!). making memories pattern paper and ribbon ... rusty pickle sticker ... and super old buttons from ek success. and day #16 ... to journal about a few things that you are thankful for this holiday season. just a few things i randomly jotted down. 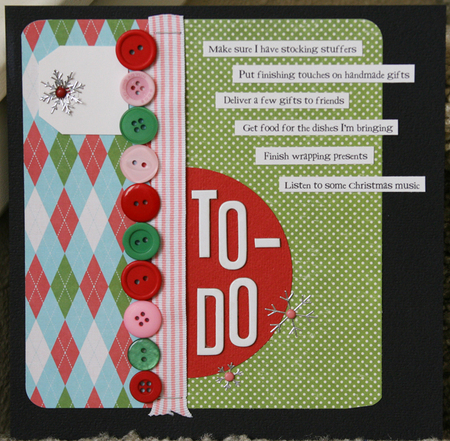 making memories pattern paper, trim, chipboard letters and accent, glitter stickers ... and brads from the card kit again. off to try and wake up a little. i had one of my kiddos show up this morning that i didn't know was coming. lol! actually, it's her normal day ... but she had been away for the weekend and there was a mixup on what day she was coming back. i thought it was tomorrow ... apparently it was today. yeah, i was totally asleep ... and get a phone call that they're waiting outside my door. lol! for some reason ... this has really thrown me off today ... i just can't get going. but since i have 7 kids here ... guess i better wake up! and some more randomness . . .
so you all seem to like the randomness posts! i'm the same way ... love reading blogs that just have random, totally unrelated to each other, where the heck did that come from, type posts. lol! did the dentist today. both the girls did great ... no cavities. actually, alyssa had a little one ... but that tooth is going to be falling out soon so they're not going to do anything to it. i was a little bummed that they did the girls one by one ... instead of doing them at the same time. that meant an hour and a half in there ... with a 5 month old on my lap and a 7 yr old bored to death. amanda even tried to get me to schedule her an appointment. lol! she was confused when i told her that i couldn't ... because i wasn't her mom. she said "but, you're my daycare mom". and her dad thought that was funny ... first time she's ever actually "wanted" to go to the dentist. joe went to the dentist this afternoon. actually the oral surgeon. said it all looked good and was healing ok. still in pain ... but switching to some basic motrin since the other stuff was so strong and made him totally out of it. and he made it though work ... bet they're glad he's back. this time of year in grocery is crazy ... especially when you're the one that actually writes the order for the store and does all the displays! i told him he could NOT take a pain pill last night before he went to work ... otherwise they'd end up with some 76,000 piece load coming in. he's be walking around with the order gun ... beeping away like crazy! so my girls are driving me crazy. all over my sense of humor. sometimes they think i'm totally hilarious ... and other times they think i'm just being mean and get all sensitive. now, since i tend to be super, super funny about everything ... i never know when things will go bad. one minute they're laughing with me ... and the next minute they're pouting or crying in the corner. so i told them that i would stop being a funny mom ... and be super serious. but apparently i can't help but be funny ... i do it without even trying. they keep telling me "you said you weren't going to be funny anymore". lol! sorry girls ... you have a funny mom! deal with it! but on the other hand ... i'm becoming one of "those moms". the ones that can embarrass you without even realizing it. i went to drop alyssa off at the school today for band practice ... just dropped her off by the office ... didn't even get out of the car. which was good. because when i got back to the house i realized i had my pink, fluffy slippers on. and i had pulled my hair up very quickly in a very messy way ... because i had been cooking lunch and my hair was in my face. and i hadn't bothered to check any of this when i went to drop her off. thank god only one of her friends actually saw me! i watched another episode of "brothers & sisters" last night. and once again ... i cried. justin going through detox ... and kitty being there for him while she was going through her own pain. yes ... that's bound to cause tears. 2 more episodes to go. my make-up order came today ... almost 2 weeks after i ordered it. i've been using the everyday minerals for quite a while now. but the gal i've been ordering from wasn't doing any orders until after the holidays. so i ordered from the site ... talk about a wait! i've been using some other awful brand for the past 2 weeks ... that wasn't looking great. not saying i'll look awesome tomorrow with my regular make-up back ... but should be an improvement! i got an email today with some good news. some of you may remember kendrick ... he was one of my first daycare kids. i watched him for a little over 3 years. he was our "boy"! so kendrick had a birthday last week ... and guess what he got? a baby sister. yep ... his mom (rebecca) had her baby on his birthday. and it gets better ... she was born at the same exact time down to the minute as kendrick was 6 years ago! i think that is cool! so huge congrats rebecca and family!!! we did our gingerbread houses today. alyssa's grandma had some houses from last year ... possibly even the year before. they're still good, right? as long as you don't eat the candy. well, i put the houses together and let them sit out all day to harden up before the girls started pushing candy on there. we finally sat down tonight to do them ... and sarah's caved about 10 minutes into it. there was no saving it ... walls came down and there was just a mess everywhere. i joked about "huffing and puffing and blowing the house down" ... and threw in some "goldilocks" and some "little red riding hood" just for confusion (i do this all the time with kids shows and songs just for fun ... see how many i can tie together in one story). this humor was not appreciated at that moment. and when i mentioned that maybe she could just invade alyssa's gingerbread house and help decorate over there ... the look of horror on alyssa's face said it all. lol! i may have to get another house and have a "re-do" for sarah later this week. guess that's it for now. i used our "blockbuster pass" to get myself a few movies this time. actually, joe is very good about getting me the chick flicks when they come out ... i just never make time to watch them. but now that i'm pretty caught up on my shows ... i'm in the mood for a movie. i have "waitress" and "nanny diaries" ... i want to get one watched tonight since the new movies come out tomorrow and joe will trade mine whether i've watched them or not. lol! total randomness . . .
i don't even know where to start. 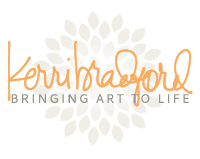 i feel so behind on my blogging! so i'll go the total random route. i think i'm done christmas shopping! went out a few times this weekend ... and i think i got it all. not that we really do all that much. at family get-togethers it's more the kids (which we're the only one with kids, how convienent!) ... and a few extra gifts thrown in here and there. got all the daycare kids ... and a few other family friends. i even have stocking stuffers ... something i always forget about! i have everything wrapped as of tonight. the girls wrapped all the kids gifts. and since the girls are playing at amanda's right now ... i took care of theirs while they were out of the house. house is all decorated ... the best i could. like i mentioned before ... most of the decorations i have are from my "country knick-knack" days. i know they still hold memories ... but they just don't feel right in the house anymore. so i used a few super cheap glass vases (that i will later fill with buttons and ribbon upstairs) ... and filled them with the ball ornaments. and i dug out all the garland and lights i used to use on the porch ... and put them up all over the house. love turning them all on at night ... and having that christmas glow. so you know i'm totally addicted to rachael ray, right? she is like my cooking idol. lol! i record her talk show every single day ... love to get new ideas for dinners. i get her magazine. i watch her "30-minutes meals" all the time on food network. thing is i save all these shows on my DVR ... until i can try them out. and then once i try them out ... i save the show until i get a chance to write down the recipe. just tonight ... i was checking out her website ... not sure why i havn't been on there yet. i was so excited to find the recipe archives ... you can find tons of the recipes from her talk show here. i printed out a ton of them ... and then deleted those off my DVR. so nice! just to show you a few i've done recentlyand can give you my word that they will be good (and easy ... seriously people, 30 minutes!) ... check out this one, this one, and this one, definately this one, and how about this one. i've got many more i can vouch for ... but i'd have to find them all for you. speaking of "pastrami" (one of the recipes above in case you didn't click on them) ... that made me hungry. and i do have some leftover pastrami. so i went downstairs and made a grilled sandwich. mayo in the middle with pastrami, provolone cheese, and some pepper ... and butter on the outside to grill it. i can't believe how good this tastes! of course the girls saw me and wanted some. it's 9:00pm ... so i convinced them to have popcorn instead! lol! joe is finally back to work. i know he had 4 teeth taken out (thought it was 5, but ended up being only 4). but it was killing me. he was down for the count for almost 5 days! in so much pain, super swollen, couldn't eat, slept all the time. i feel for him ... really, i do. but that left me to do everything. and right before christmas ... when there is extra shopping, cleaning, decorating, etc. but he just left for work a while ago ... so hopefully he'll be ok there tonight. i spray painted my "paint shelf" today. i've been wanting to do that ever since i moved my studio upstairs since it didn't quite match in all it's whiteness ... so almost a year and a half. finally got motivated to do it ... and it took me all of an hour or so. lol! i'm doing a little write-up about it and something else ... so i'll let you know what that's about when the time comes! you know i had about 7 episodes of "brothers & sisters" just a while ago? i've watched 4 of them ... and i have 3 left. such a great quality show ... i love it! and the episode where sarah had to let go of her kids ... omg, i was crying so hard! the tears where streaming down my face. then i get myself all composed ... and the next episode with kitty and the baby ... in tears again! i can only imagine what the next 3 episodes will do to me! alyssa and sarah are keeping busy while they're off school. still get bored at times ... hard when we're stuck at the house with all sorts of kids and can't just up and do things. we are heading to the dentist tomorrow ... with only 2 kids in tow. amanda is spending the night tonight ... they've been having lots of sleepovers and extra time with her. alyssa has a band concert at school on thursday ... she started learning the clarinet. loud! lol! we're also making gingerbread houses this week ... we have 2 of them here ... and some sugar cookies. i'm cooking for about 20 people on saturday. you'd think i would have a plan by now ... and yet i don't! but i have some recipes in mind. and i can quarantee you they will all be rachael ray stuff. lol! i'm actually thinking of cooking just turkey breasts ... not the entire turkeys. looking into that though ... joe's talking to the meat guy at work. want to bet i can do the entire dinner in an hour? lol! i need to scrap ... i want to scrap ... and yet i can't. i have projects i need to do ... things i want to do. just not getting any creative juices going. i did manage to clean out about 10 inches of pattern paper and old cardstock. seriously. it's all in a box downstairs ... giving it to a friend of mine who is finally wanting to learn to scrap! ok ... that's it. for now. i don't want to use all my random thoughts up in one day! like that would ever happen? lol! journal my christmas days 5,7,10 . . .
since my minds works better in totally random thoughts ... why not do my "journal my christmas" pages in random days, right?!?! lol! i'm not going to think of how behind i am ... just glad i have 3 more done. definately going to do some more this weekend though ... because i truely love the idea of this journal the more i think about it. love getting all that christmas goodness down in writing ... so that my girls can look back and remember just how we celebrated! first up, day 5 ... journaling about how we count down the days until christmas. i thought about taking a picture of the advent project i made this year ... but i like the way this album has no pictures so far. lol! makes it easier somehow. making memories pattern paper, metal snowflakes, and glitter brads ... american crafts chipboard numbers ... and a rusty pickle sticker. day 7 ... journaling about our quest to finish the christmas shopping. i have to say ... my journaling on these 2 tags went in so many different directions. a few times i wasn't even sure what i was supposed to be journaling about. lol! so basically, one tag is about my procrastination on my shopping no matter what my intentions are. and the other tag is about what the girls are getting this year ... not showing that whole tag just on the off chance they stumble upon this post. lol! making memories pattern paper, stickers, brad, ribbon ... scenic route chipboard letters ... 7 gypsies stickers ... and the polka-dot tag was from some daisy d's paper. and day 10 ... to make a page using some of the wrappings you intend on using this christmas. the idea was to use a piece of your wrapping paper and add a to/from tag. i figured this paper went good with the colors i'm using in this album ... and the chipboard tag is actually from the christmas card kit i used this year (it came with all these tags that i'll use instead of the normal tiny sticker labels i use). 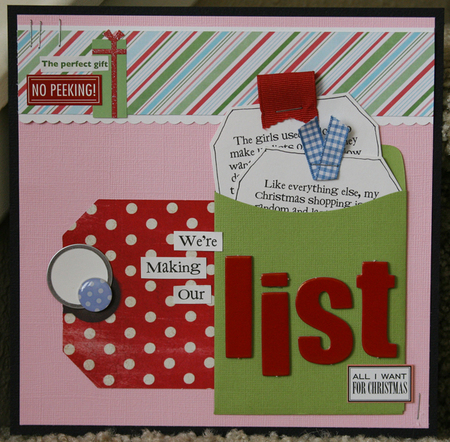 just added a few heidi swapp chipboard letters ... some making memories rubons ... and my journaling. so now i've done 6 days ... only 8 behind now. lol! more random updates to come later ... have to get back to the kiddos now! photos to distract you . 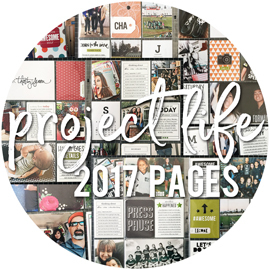 . .
i know i promised to share my "journal my christmas" layouts that i was working on. but i just finished up 3 of them tonight ... never got around to doing the journaling this afternoon. so i'll have to wait until tomorrow to take some pics of them ... and then i'll share them. in the meantime ... i thought maybe i could distract you from the lack of scrapping stuff ... with some recent photos i took. 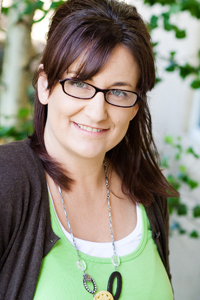 my awesome neighbor ruth that i took some family photos of a few weeks ago? well, she has the nicest sister, mia ... and she asked if i could take some family photos of them too. we did these last friday ... ordered everything on monday ... and i already got her poster sized prints today. talk about fast! such a gorgeous family! here's a few of my favorites. you can see the entire album HERE. back tomorrow with scrap stuff and random life updates! update on christmas journal . . .
i had to laugh last night when i was talking to my friend deneen. i had mentioned the journal your christmas class. and she told me that "you HAVE to share some more of your pages"! lol! here's the thing ... i'm now 9 day behind. so i've done 3 of the 12 days. lol! not bad odds for me really. those first few days fell on the weekend and then a non-busy monday ... so i had no problem fitting them in. then life happened. kids running around all day ... lots of kids. and by the time they left at night ... i was too tired to do anything that required thought. so i put it off. but since my desk is clean ... therefore clearing up my mind ... i was ready to work on it some more. so yesterday while the babies were sleeping ... i started 4 pages. i have 9 to catch up ... so that fact that 4 of those are almost done is good. i just need to journal them and then i will share what i have tomorrow! right now ... as i type this ... joe is off getting 5 teeth pulled out! he had a tooth that needed to come out ... and i guess they figured why not do the wisdom teeth while we're in there. they weren't bothering him at all. but we figured it really wasn't going to cost us much more to do them all at once. and since we have a certain amount of $$$$$ that the insurance will put out for dental ... we figured we might as well use it. my mom took him over there since i have all the kids. i had mine pulled out about 15 years ago ... so i can't remember what to expect. i do have some jello and pudding in the fridge ... and other random soft foods. lol! he should be pretty out of it once he gets back. he worked last night ... in fact he worked 11 hours (plus the hour commute). meaning he left for work about 7pm last night ... worked all night and got home at 8am this morning ... and then left for this appointment at 9:30. so they may not have even had to put him to sleep ... he probably just dozed off on the table! lol! i think the worst part was that he had to work all night ... but couldn't eat or drink at all. how do you do physical work (he works nights in grocery) ... and not have at least some water or something?!?! updated: joe's back and totally out of it. lol! he was so hungry that he was trying to eat tons of stuff ... but not much success seeing as he couldn't feel anything, couldn't chew, and was still bleeding pretty good. finally got his pain pill in him though and he's out cold upstairs! 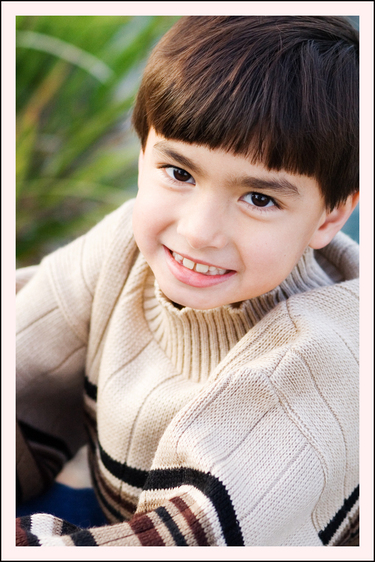 and i'll leave you with a few cute pictures of nikolas ... hate to post without a picture! love the look in the first picture ... the big eyed "what the heck" look. 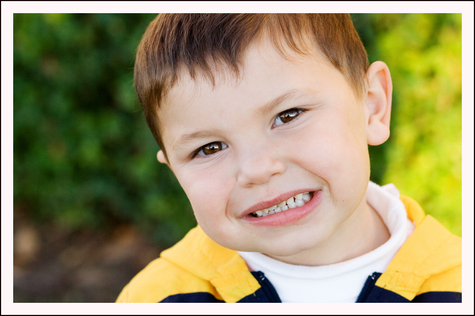 and the second one isn't great ... but shows his bright, toothless smile! 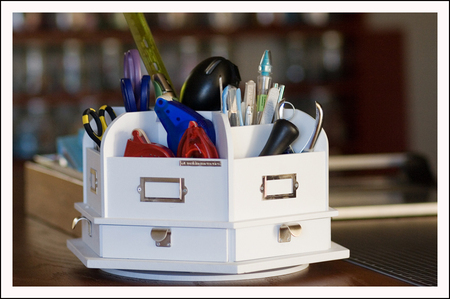 i've been waiting patiently for this to come out ... the MM desktop carousel! it's just starting to ship and you can find more info on the MM blog. this is such a great idea! i've had so many of my tools stored in all different places. but this thing holds a ton of stuff! it's 6 sided ... with tons of compartments ... and 6 smaller drawers. and the center is super deep ... i even put my tag maker and tag curler in there ... and they're pretty big tools. the little drawers are perfect for smaller things ... so far i have needles and some thread in one (i use them all the time with buttons), all the extra pieces for my notch tool and eyelet setter in one, distressers in one, etc. and the label holders ... will have to do something cute with those. i don't have it all filled up just right yet ... but this gives you an idea, right? this is seriously a must have item. and did i mention it spins? lol! sarah loves the fact that it spins ... i keep telling her to keep her mitts off of my stuff. may have to get the girls one for their supplies! lol! and the most amazing thing ... this is one of 4 things on my scrap island right now. lol! just the carousel, my huge self-healing mat, my trimmer, and a wooden box tray with some newer items in it (so i try and remember to use them). i did some cleaning up last night. i had way too many things going at the same time ... and i wasn't being very productive. so i made new areas for things i'm working on ... things i need to work on ... and things that i would like to work on at some point down the road! my empty desk is making me happy right now for 2 reasons. the first being that i feel like i can think ... not so much stuff competing for my creative attention. the second reason is the endless amount of creative possibilities ... it's all up to me what i want to create next! 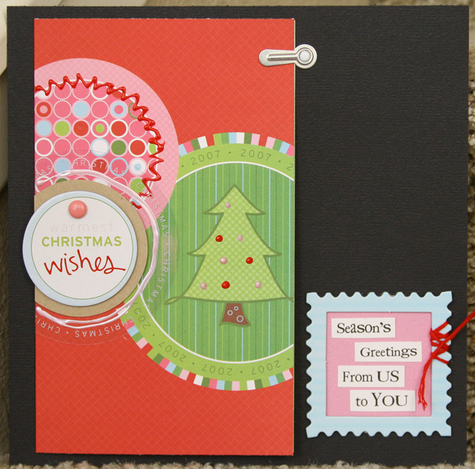 scrap pie and a christmas tag . . .
seriously ... how cute is that? and the girls thought i had ordered some kind of cake. lol! do you remember me telling you that i was done with being "tagged"? well, i got tagged again today ... and those that know me pretty well know that i can never say "no" to anything. lol! and for those of you that didn't know that ... don't take that as "please take advantage of me and my kindness". lol! totally kidding of course! ok ... so laura tagged me to do this christmas "getting to know you". luckily i just did this in an email earlier this week ... the beauty of copy and paste, right? real tree or artificial? i've been doing a fake tree for about 8 years now and love it ... no mess or watering ... although i detest fanning out all the branches! 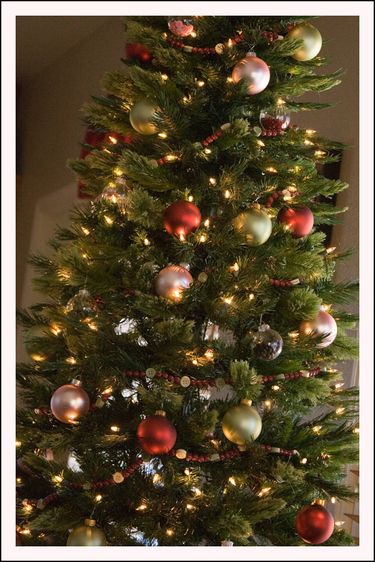 when do you take the tree down? i'm lucky if it makes it to new years ... by the time christmas is over i'm tired of having a tree in my house. lol! favorite gift received as a child? not sure ... terrible that i don't remember much from my childhood. lol! worst Christmas gift you ever received? we do the gift exchange game with my extended family every year ... supposed to be a $20 gift ... one year i came home with some $5 picture frame. i secretly know it was my grandma's gift she brought ... so i feel bad for not being appreciative. lol! favorite Christmas movie? "a christmas story" ... they play it for like 24 hours straight on christmas day ... and i can watch it over and over ... "you're going to shoot your eye out!!!". lol! 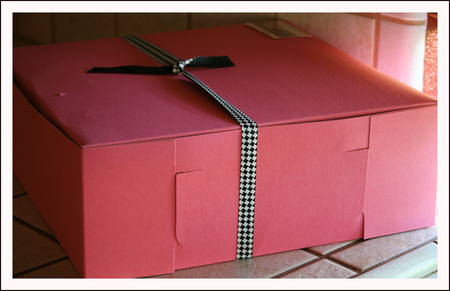 have you ever recycled a Christmas present? yes ... is that bad? travel at Christmas or stay home? stay home ... my parents and my brother all live within a few blocks from me and we like to make all the extended family come out to us. most annoying thing about this time of year? the crowds of people that seem to be wherever i need to be! how many pictures did i take this week . . .
i know, i know ... i'm 3 days behind on the "journal your christmas" class. but i'll get to them. just had to get some other stuff done these past few days. i'm finishing up a few things tonight that have to be mailed out tomorrow ... and then i have about 10 different projects that i want to start! lol! so for now i thought i would share a few pics. apparently i have taken all of 4 pictures this entire week. actually i think 1 of them was from last week. lol! this is actually a cute one of haley. i didn't think i got anything good when we tried this. i really want some pictures of her with the cute knit hat ... and i ended up finding the exact same onesie that miranda wore for her pictures. i was so excited about that ... it's a long story! so this one is cute ... but i will get some more of her in this! 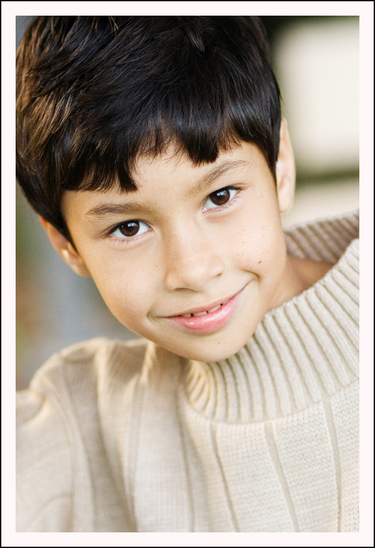 i told matthew yesterday that i needed one picture of him to add to the shutterfly book i'm working on. so after he had a snack, he kept asking me if i needed to clean his face. i was busy with something so i told him he was fine. he kept asking me though over and over ... but i figured it was just typical "matthew questions". lol! then he asked me if i wanted him to take his picture. so cute of him to remember. it wasn't until i pulled up this picture on the computer that i realized why he was asking me to clean his face ... he had food all over. lol! i tried to photoshop some of it super quick ... not the first time i've had to clean someone's face. 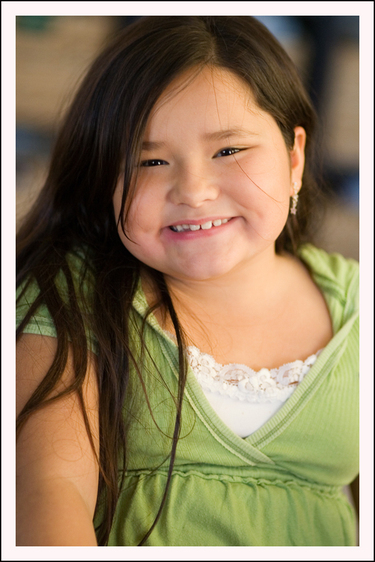 amanda ... my third "daughter" as she keeps calling herself. lol! and for once i took a semi-decent photo INSIDE the house. i don't know why i have such problems with that. and i didn't even use a flash on this. i must have had some decent light coming in the window for once. and is it wrong that i'm going to use this picture on the last page of the shutterfly book ... with the caption "the end"?!?! lol! sarah told me i was being mean to haley ... but i just can't resist! how cool is this . . .
so i got an email last week from scrap-a-faire that i had won one of the grand prizes from their event a few weeks ago. a big prize package from shutterfly. 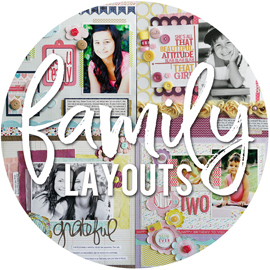 a 8x8 20-page photo book, a 12x12 20-page photo book, 2 8x8 digital scrapbook pages, and 2 12x12 digital scrapbook pages. how cool is that my friends?!?! now of course it required me to spend a few days uploading a gob of pictures to their site. i used them about 2 years ago for printing ... but all my pics now are on winkflash. but i have to admit ... the uploading was so super easy ... much easier then it used to be. and i have been frustrated with winkflash lately ... always kicking me out and losing whatever it was doing. i only had problems once ... and it still saved what pictures had been uploaded and just had me retry the ones that didn't make it. so nice! when i sat down to do the books, i thought at first it was almost as if it was too much thought ... figuring out what pics you wanted on what pages and all. i will always love my actual pictures and paper the best ... but i did have fun with it tonight. the 8x8 book i am going to do of alyssa and sarah. but the 12x12 book i decided to do with all our favorite pictures of the daycare kids from the past year. each of the kids has a 2-page spread that has 8 pictures total ... and then there are some pages at the end with just a bunch of random, everyday photos. i did have to combine nikolas and matthew ... because i just didn't have enough photos of each of them. i literally need 1 more picture of each of them ... which i will take tomorrow since they're both here. i think it'll be neat. i have tons of scrapbook layouts of the daycare kids from just this past year. i actually have about 7 albums (5-12x12 and 2-8x8) stuffed full from the past 6 years. but i like the idea of having them collected in a nice book to look at all at once. in fact ... i could do it as a yearbook?!?!? do you think the parents would order them? lol! actually, i think that would be kind of cool for the kids to look back on and remember all the other kids they used to play with. i give copies of all my photos to the parents. the kids always want to hold them and look at them ... i keep saying i should order extras so that they can tote the picture around and mom and dad still have the good wrinkle-free copy. lol! anways ... going to have to show this to my parent tomorrow! 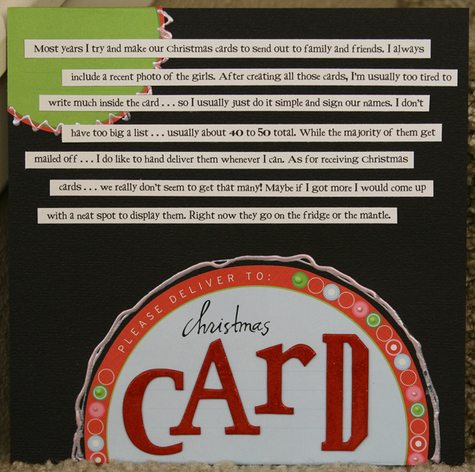 journal your christmas day 3 . . .
today's "journal your christmas" topic was christmas cards. since i wanted to include one of our cards from this year ... i made this a 2-page spread. first off ... the card. 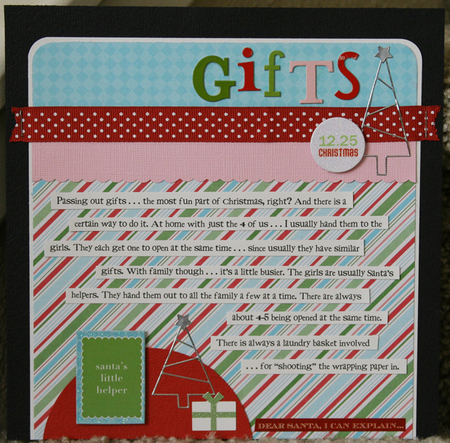 i ended up getting the BH card kit from creating keepsakes. and the main reason i decided to get it was seeing the way that cd muckosky altered these cards. i totally used her ideas with the puffy paint and extras ... so i cannot claim them as my own. lol! this card was my favorite out of the 4 ... and now i'm glad i kept an extra for me. i used the circles off the front of the envelope for the first page ... and then added some puffy paint just like on the card. the heidi swapp chipboard letters i painted with making memories "cranberry" paint and then added "cranberry glitter paint" on top. the second page i just adhered the actual card ... and added a fun "postage" chipboard frame on the side. i think of 2 things when i look at this layout. first ... i feel like i need to add some more "stuff" ... still a lot of blank space on there. second ... i think it's perfect ... and done (which counts for something). and it was fitting to journal about cards today ... seeing as i took all mine to the post office this afternoon. i wanted to take them in and make sure the postage was ok on them. since a few had bulkier items like buttons and brads ... i wanted to make sure they weren't considered irregular shaped or anything. can you imagine mailing them off ... only to have them come back to you? but then the dude told me that it would cost me an extra 17 cents each ... and then i was just irritated. lol! this is a little postal annex that i have gone to occasionally (thinking it won't be busy) ... and for some reason i'm not always convinced the dude is telling me the truth. lol! things have always gotten mailed after i drop them off ... but i still give him the "are you serious" look when he answers my questions! journal my christmas . 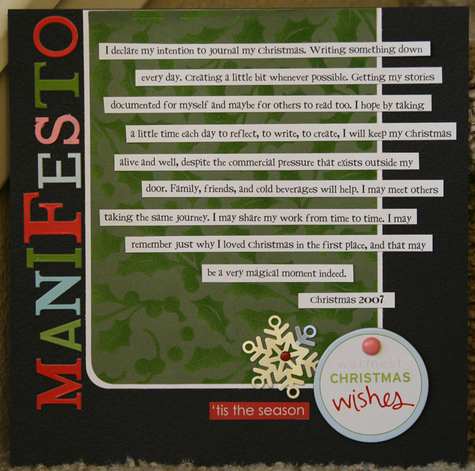 . .
i signed up for the journal your christmas class last week. i had seen a few people do this last year and it seemed like a great idea. and then i saw it mentioned again this year. so i figured it'd do it. the main reason i was hesitant is that i'm not always good about keeping up with something like this ... where i'm really not on a deadline or held accountable if i don't finish. lol! i signed up a little late ... so i havn't done the album cover yet. but so far i have done the first 2 days. the first day was to create a manifesto ... an intro page of sorts to our albums. explaining what this album will be about. i used the manifesto that was given to us ... just copied it word for word (except i changed "hot drinks" to "cold drinks" ... because i hate hot drinks. lol!). i was so upset to realize i didn't have an "S" for my title ... then found another set of chipboard letters from a different collection and realized the pink "S" would be perfect. 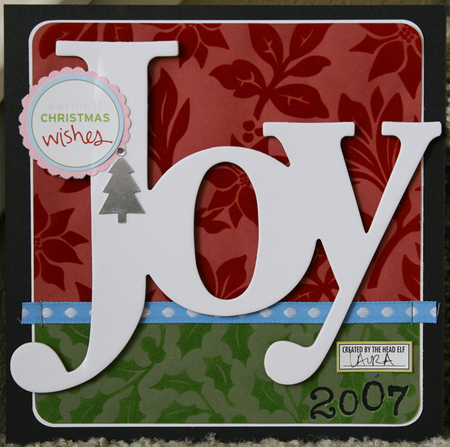 and you have to feel this paper to really appreciate it ... flocked poinsettia paper! i'm going super simple on this. as much as i love all the fun details and embellishments ... i know myself too well. and if i want to do a page every single day this month ... i have to go simple and quick. i decided to do an 8x8 album ... not too big and not too small. so far i havn't even used photos ... because honestly i think i'll do these faster and on time if i don't have to worry about photos. maybe i'll add some photos to other pages ... not sure yet. i had a ton of black cardstock cut to 8x8 ... i was going to use it years ago for something. so i decided to just use all black for my pages ... less decisions to make. 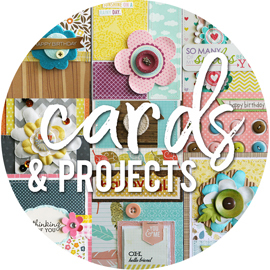 i have mainly making memories products pulled out ... a lot of the deck the halls collection which i think is so fun. and then some random christmas stuff. i have an entire baggie of those MM metal snowflakes from ages ago ... so i'm sure you'll see those a lot. 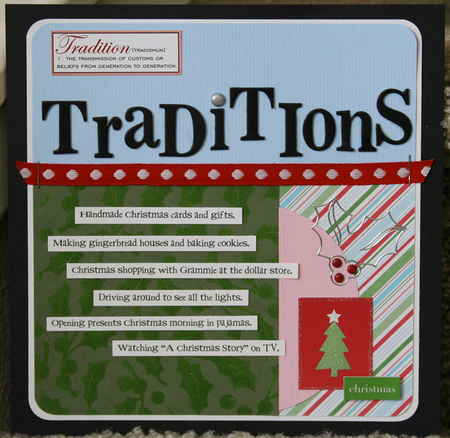 and that "christmas wishes" chipboard accent ... left over from the christmas cards i put together (i messed up on one). 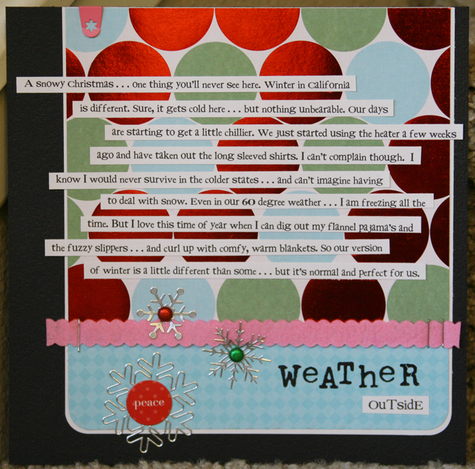 today's prompt was to journal about the christmas weather. i think part of the "challenge" so to speak was to also use snowflakes in some way. i can't even remember the last time i've been in snow ... we're talking well over 10 years ago. lol! it has been getting chilly here though. today it was 60 degrees ... i'm seriously freezing. so i know i would never survive with snow. and have you seen these line art stickers? they are so cute. the first time i used them i was scared to even peel them off. lol! i was afraid they would get all bunched up in a ball ... because they're so skinny. but they work so good ... and i love the look of them. so there you go ... i am on track. 2 days in ... and i'm caught up. lol! i know, i know ... a page a day shouldn't be that hard. and yet i get distracted ... and forget to keep up. but now i've put it out there and you all know i'm doing this. so i am now held accountable ... to you. lol! i probably won't post these daily ... but will share a few times a week. so if you don't see any for a while ... feel free to check up on me and make sure i'm still keeping up. lol!